Oliver loves being an inside kitty at night. He's usually eager to come inside. And even though he spends nearly every night inside, he still manages to get into fights. Last week he got into a particularly nasty scrap. Who's he fighting with? This black cat has been coming around for several months. 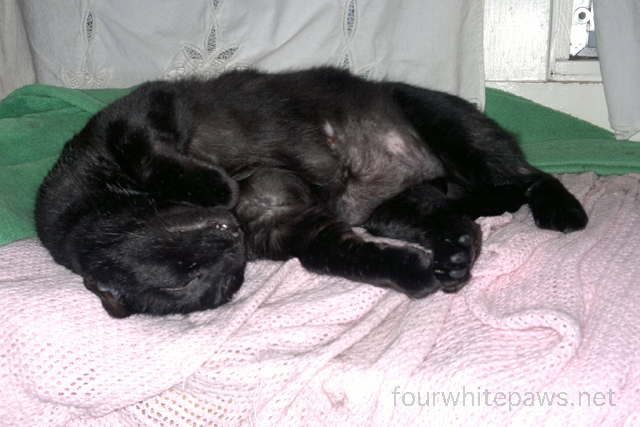 He only comes at night, and being that he's a black cat, it's been difficult to distinguish him from Oliver's family. Oliver's not fooled by his appearance though, he sure knows that he's not a member of the family. The other night, when I went to bring Oliver in, I heard Oliver caterwauling. I hate that sound. I ran outside as fast as I could and tried to break up the fight. Oliver and this cat were going round and round. The new cat tried many times to run away but Oliver wasn't having any of that. I was beyond freaked. 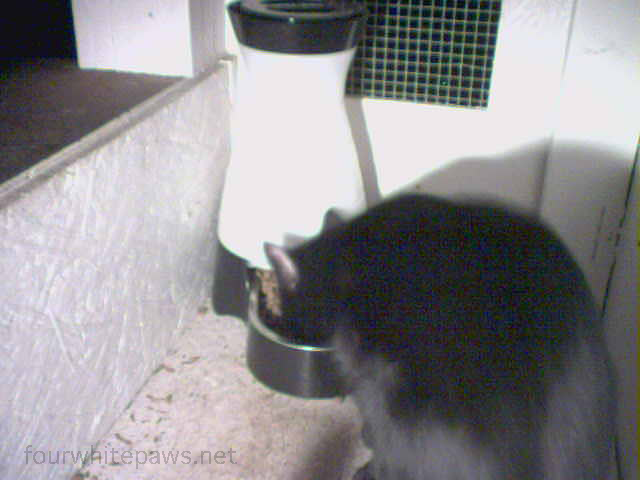 These are images of the new cat having dinner in the feeder. Low light and poor camera resolution make the pictures fuzzy, but I've been trying to look for an eartip and I'm not seeing one. This guy must be homeless if he's willing to risk fighting Oliver for access to food. This was the scene last night, as we got home. 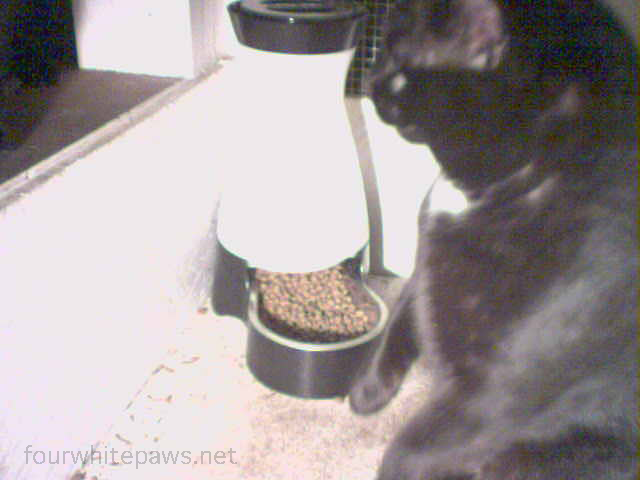 Oliver was up on the feeder ledge, having cornered the new cat in the feeder. When I distracted Oliver, the new cat made a run for it. Oliver darted in quick pursuit but thankfully I was able to tackle a very unhappy and poofy Oliver before anymore damage was done. It's time to trap this new guy, but then what? I release him back in the yard and Oliver's not going to start sharing his yard with any cat, he's very territorial. Right now, I've got more questions than answers. I'm at my whits end trying to figure out how to solve the Oliver dilemma. I can't leave him inside all the time because he urine marks (even more now that he knows theres an intruder on his land). Theo is getting more and more anxious about having Oliver inside. Theo has the sharpest memory out of all the cats. 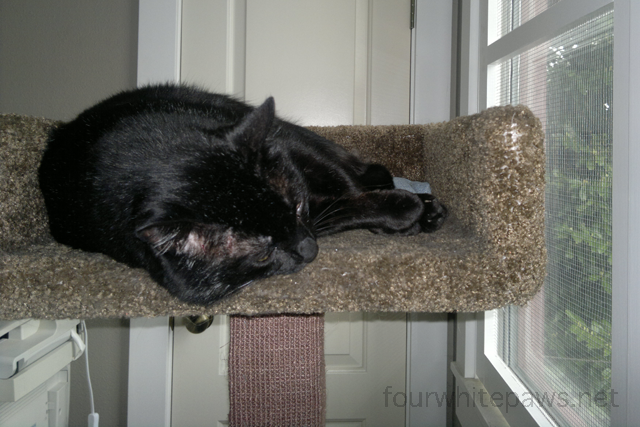 He remembers that he once had access the back porch but doesn't anymore because Oliver's there. Now, he has lost nighttime access to the office room, because that's where Oliver sleeps. Theo is not happy about losing more and more territory to Oliver. If I leave Oliver outside all the time he fights every neighborhood cat or newcomer cat around the neighborhood. I've entertained thoughts of trying to relocate him to a barn somewhere. He's very bonded with me, would do anything with me, but he only tolerates contact with Laura and doesn't tolerate any contact with any other humans. 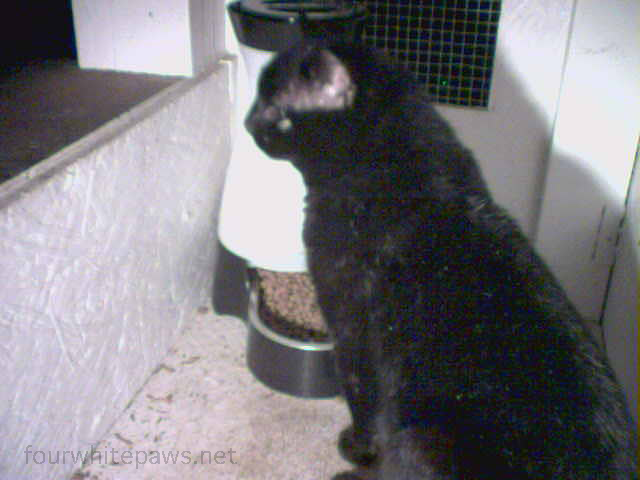 That and his persistent urine marking behavior make placing him in another home not workable. He loves being inside and loves being cuddled. With me, he's a very sweet, affectionate, playful and silly boy. I don't know that I could willingly give him up, I'm so very attached to him. Oh Oliver, what am I going to do with you?!?? Personally, I would just stick it out. Much progress has been made with Oliver, and he cannot be separated from his family. The new troublesome cat is probably only going to be a temporary problem, as he will "disappear" someday, like most outdoor cats. If you trap the troublesome cat, maybe someone would adopt it. We do not know it's temperament towards friendly humans. Enjoy the rain and fog! We are having the same problem with a big Tom looking for a mate now that Spring is near. Our cats are all neutered but when that is figured out the fights come over territory. We are in the scaring him off phase but will trap him if it continues and relocate him. Good luck! I don't know what you're going to do with Oliver, but I can't see you relocating him, you're both too attached to each other. If that other cat can be trapped, maybe he'll be okay to be fostered by someone and then adopted. You don't know yet (presumably) if he's had socialization with humans. Poor boy. I'm sending you Light around this, for the Highest Good of All Concerned. Perhaps Oliver would be less aggressive if New Cat was neutered? Our crew gets all up in arms about the intact strays but not as much over the ones that are allowed out but have homes (and are fixed). I certainly plan to neuter the boy if he's not already, but I don't think neutering will make a difference to Oliver. Before I started taking him in nights, I routinely had to go out in the night and break up him fighting. Who was he fighting? The neighbors across the street and a few houses down have a sweet, friendly boy who is neutered. He rarely leaves their yard. Oliver goes over there and beats him up in that cat's own yard! Oliver thinks the whole city belongs to him. No doubt my sweet, affectionate Oliver is a neighborhood bully. I agree that neutering the new guy should help, but not if Oliver is already roaming the neighborhood picking fights. I like the idea of midask9....maybe an enclosure to keep them safe without letting them wander too far. Is there any way to remove the food at night? This is a tough dilemma. I don;t see how you could rehome Oliver. It would rip your heart out and his too. I love the idea of an animal enclosure outside but would Oliver be happy with that? I hope you can find a happy compromise that everyone is satisfied with. also remember that when you neuter a stray cat, not only do they have less of a need to mark territory - which annoys resident cats - but their territory shrinks down and they are far less likely to wander as far. his home base might be far away and when you neuter him he might not feel the need to come around any more..
but then again, he might know that there are resources here for him , food, a safe place to sleep, etc, which makes it enticing for a homeless kitty..
Abby said it, I think. I was thinking the same thing, What a terrible dilemma you are in. I am going o think of it and see if I can come up with anything that may help. I feel for you, Oliver and the poor guy out there trying to get a meal. It's very heartrending for ALL of you. Neutering the new guy might calm things down a little. But we suspect eventually you are gonna hafta try to relocate the new guy. I'm sure you've already heard about it or even tried it yourself, but what about Feliway diffusers for the house? That might help Oliver with the urine marking? Or a calming collar? We have a Sentry calming collar on Carmine and his anxiety has diminished trmendously. He doesn't have any problems with urine marking, though, so I don't know how well it works for that. I hope you can figure out a suitable solution for everyone.